A distressing number of Experimac franchise owners are closing their stores, fighting off bankruptcy while trying to save their homes and assets. Does franchisor United Franchise Group (UFG) still make money when its franchises fail? How about those who continue to hype, promote and sell this dubious investment? Do SBA loan packagers like Paul Bosley and First Financial, or SBA lenders like Celtic Bank, profit from what’s now clearly a risky investment? Who gets hurt… and who continues to profit… even as franchisees fail? 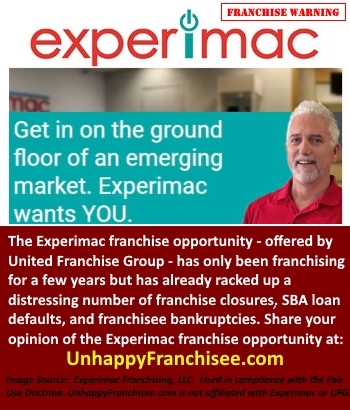 (UnhappyFranchisee.Com) We have reported that United Franchise Group (UFG) continues to aggressively promote its Experimac franchise opportunity despite the fact that the Experimac franchise turnover rate is an estimated 36%, Experimac franchise SBA loan defaults are estimated at 20% – 35% and rising, and it appears that 23% of the surviving Experimac franchise stores may be for sale… some at fire sale prices. Does United Franchise Group (UFG) Profit From Failed Experimac Franchises? With such a high number of franchise owners in distress, and facing the need to make a systemwide name change, one might think that United Franchise Group and Ray Titus would cease franchise sales in order to concentrate on supporting the franchise owners fighting for survival – and come to the aid of those whose decision to trust UFG has left them fighting for financial survival. One might think United Franchise Group (UFG) and Ray Titus might call a moratorium on new franchise sales until they figured out what is broken in their system, and what is leading to such a high failure rate. One might even think that Experimac might suspend royalties or drop its mark-ups on equipment, supplies, and vendor kickbacks to make its franchise model a little more sustainable. However, United Franchise Group and Experimac/Experimax continue to hype their industry “awards” and paid-for accolades, and advertise Experimax as a great franchise investment. We haven’t heard of any initiatives that indicate that they are even concerned about their franchise failures. Could it be that United Franchise Group and Experimac Franchising, LLC are set up to succeed even if many or most of their franchise owners fail? We invite CEO Ray Titus and United Franchise Group to set us straight if we are mistaken, but our review of the Experimac Franchise Disclosure Documents from 2014-2018 indicate that UFG has a financial incentive to focus on selling, rather than supporting, franchisees or fixing a flawed business model. In 2017, only 10% of Experimac Franchising LLC’s total revenue was from royalties from established franchise locations. In 2016, franchise royalties amounted to 4.27% of total revenue, and in 2015 royalties accounted for less than 1%. In the audited Financial Statements in its 2015-2018 FDDs, Experimac Franchising, Inc. posted initial franchise fee revenue of $2.3M in 2015, $4.7M in 2016, and $4.0M in 2017. They posted revenue from initial equipment packages for new stores of $1.9M in 2015, $7.1M in 2016, and $7M in 2017. For the years 2015-2017, Experimac Franchising Inc. generated total revenue of $29,136,144. Of that, only about $1.8M (6.2%) came from existing store royalties. In fact, Experimac Franchising, LLC paid more than $11 million in sales commissions for that same period, more than 6X what they collected in royalties. United Franchise Group charges a higher franchise fee for their relatively unproven, untested Experimac franchise than major franchises with decades of experience and universal brand recognition. The equipment package contains all of the equipment and supplies, except for a few items, to begin operations…. For the year ended December 31, 2017, our gross revenue from the sale of equipment and supplies to franchisees was $7,007,419 or 56.3% percent of our total revenue of $12,449,439. We are the only approved supplier of the required equipment package. The cost of the retail accessories and repair (parts) inventory/opening inventory package including shipping is $15,000 to $39,000 plus taxes. The retail accessories and repair (parts) inventory contains an initial inventory of products including accessories for cell phones, computers and tablets and other electronic equipment and parts you will use to make repairs and upgrades. The opening inventory package contains an initial inventory of pre-owned electronic equipment. The costs of the retail accessories and repair (parts) inventory/opening inventory package are due at closing and are nonrefundable. The “Preferred Supplier” affiliate entity is owned by CEO Ray Titus and President Jim Muir. The affiliate is so closely aligned with the franchisor, checks written for the Preferred Supplier package can even be made out to Experimac Franchising LLC. It appears that having broken Preferred Supplier off as a separate entity means this revenue doesn’t have to be disclosed in the audited financial statements. Equipment & Inventory Financing Kickbacks: According to the 2018 FDD, Experimac Franchising LLC “indirectly” arranges equipment financing for franchisees and receives a fee from Advantage Leasing Corporation equal to 1% of the total lease amount. The 2017 FDD states that Experimac Franchising receives 2% of the total lease amount from Advantage Leasing Corporation. Approved equipment leasing companies have included TimePayment Corp. (2015, 2016 FDDs), VFS LLC (2017 FDD), & Advantage Leasing Corporation (2017, 2018). Input needed: What is the default rate on Experimac equipment leases? Are these equipment leasing companies able to make a profit on Experimac leases given the store turnover rate? Please comment below or email in confidence UnhappyFranchisee[at]Gmail.com. Benetrends is another company that seems to get their money whether franchise owners succeed or fail. Benetrends helps Experimac owners put their 401(k)/IRA retirement funds in play (and risk) with what’s aptly called ROBS or Rollovers as Business Startups. Have you had experience with Benetrends, Guidant, or other ROBS service providers? Please share a comment below. EXPERIMAC SBA Loan Pipeline: Are Taxpayers (Also) Being Defrauded? 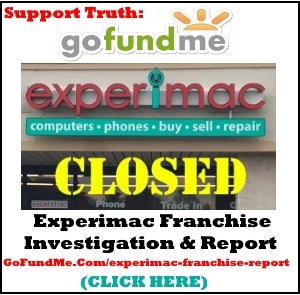 Experimac franchise owners have reported a very disturbing system that seems designed to extract money from them and, eventually, American taxpayers. If you can help provide some insight into this somewhat complicated and highly disturbing system, please contact the author in confidence. Franchise owners report that they were directed by Experimac to a man named Paul Bosley, who owns a company called HealthClubExperts d/b/a Business Finance Depot. Bosley, of Mt. Dora, FL, is also a former Vice President of First Financial. Franchisees allegedly paid $5,000 for Paul Bosely and First Financial to help put together and submit their SBA loan application to a particular lender, Celtic Bank. Bosley has bragged at having funded more than 70 Experimac franchisees, as well franchisees of other United Franchise Group concepts. Celtic Bank participated in the fraudulent origination of countless loans used in the startup of Experimac franchises. A third party, Paul Bosley acted as the intermediary charging upfront fees to handle the creation and assembling of loan applications which included falsified financial projections for Experimac locations. The documents produced were identical in nature across more than 50 applicants and were solely produced Bosley and presented to Celtics underwriting group. It was well known by Celtic that this practice was in place and Bosley held close ties with this lender at the Florida branch. Celtic Bank apparently processed and approved dozens of SBA-guaranteed loans issued to Experimac franchisees, many of whom have defaulted or are in the process of defaulting. It’s our understanding that in the case of a default, SBA lenders like Celtic Bank go after the franchisee and any guarantors for payment. This may include seizing assets, including homes, cars or other assets. Once the franchisee has been completely drained or declared bankruptcy, Celtic Bank would recover up to 85% of their outstanding loan amount from the Small Business Administration ie the American taxpayer. 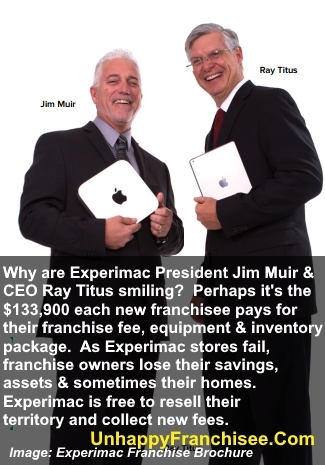 So EXPERIMAC franchise seems to be a real moneymaker – for everyone except the franchise owners and the American taxpayer. WHAT DO YOU THINK? ARE YOU AN EXPERIMAC FRANCHISE OWNER OR FRANCHISEE OF A UNITED FRANCHISE GROUP BRAND? DO YOU KNOW WHY EXPERIMAC FRANCHISES ARE FAILING? PLEASE SHARE A COMMENT BELOW. I would be looking at other primarily product franchises like mufflers, etc. Most of those product franchises make money from the required product purchases. Don’t know whether these numbers are out of line with those other franchises. Could be. Here is the thing that is far more troubling, at least to me. You pay for the trademark — it is a trademark license. And then it turns out that what you paid for is about to get cancelled. That is appalling stupid behavior by the franchisor and its trademark counsel. From time to Lime, the Company is involved in litigation, and most or which is incidental and normal to its business. In February 2017, an Opposition was filed with the U.S. Patent and Trademark Office (USPTO) Trademark Trialand Appeal Board (TTAB) against the Company’s application 1’01’ a registration of its logo mark. June 2017, a Petition for Cancellation was filed with the USPTO to cancel the registration of the Company’s registered trademark. This is a very accurate assessment of Experimac and UFG. You mentioned Benetrends, they also charged a $5,000 fee to use their service and Fidelity Investment knowingly uses this money to invest money into a failing business. This seems to be a breach of their fiduciary responsibilities. When we were going through the process of getting our SBA with Paul Bosley he changed our numbers a couple of times so we would qualify. I agree. Apple, Inc. has to be one of the fiercest protectors of its IP and TMs in the world, so it’s hard to believe that they would have launched the chain with “Mac” in their name… especially when it was clearly a reference to the trademarked products. They must’ve known this was coming since they have used the ExperiMAX name for international development for some time. Last month they filed a material amendment to their state registrations to reflect the name change. I don’t even think there’s a mention of the reason for it or a mention of the trademark dispute in the litigation section. Anyone with information about Paul Bosely and his First Financial/Celtic Bank pipeline can contact me in confidence at UnhappyFranchisee[at]gmail.com. Did Bosely also coordinate the equipment leases with TimePayment Corp.? Anyone with experience dealing with Benetrends can contact me in confidence at UnhappyFranchisee[at]gmail.com. I have heard of at least one person having been hit with IRS penalties due to Benetrends. Is anyone else facing similar problems? All of the above is true, and Paul changed my numbers as well. He basically fed me what he knew I needed in order to get approved for the loan. It felt like they were all working together and knew exactly what to do to make everything look right and to move things along, even if they weren’t even remotely close to reality. I have a close friend who was taken complete advantage of by Experimac. Definitely was described to him as a much more solid investment than clearly it turned out to be. I would definitely be interested in speaking to your friend about his experience on a confidential basis. Please share my email with him/her: UnhappyFranchisee[at]gmail.com. Paul Bosely did more than 70 Experimac loans this way, and also got funding for other UFG franchises as well. They must have had quite a pipeline set up to process that many in a short amount of time. Does anyone remember what his fee was? I’ve heard 2%-3% of the loan amount paid before closing. Is that right? Another player in the game was Tim Phillips. He’s an UFG guy involved with finance too. You should check him out. No surprise that UFG is having “issues,” since UFG has such a horrible reputation in our industry-especially for hammering on candidates to buy their franchises. And as an added bonus, they’re the geniuses who came up with the idea of having a retail store franchise that…wait for it…sells franchises. In a perfect scenario, UFG would buy out Brad Sugar’s franchise “opportunity,” as well as the new franchise coming soon from John Hewitt. Doing so would make things easier for writers who want to expose questionable franchisors who just don’t care. It would be another form of consolidation. Paul Bosley was the intermediary for Time Payment as well. He did very little work except sending over the projections worksheet with sales projections already there. My only additions were starting cash amount and rent. He told me to change two cells and what to put there. My Celtic rep was Laura Harvey. She was very anxious throughout the process. Bosley said ignore her she has a gun to her head to push these loans through. Now I understand all the anxiety because the whole process was illegal.